Posted on Thu, Jan 26, 2012 : 5:30 a.m.
More changes to Ann Arbor Public Schools transportation system seems inevitable, according to school board members at Wednesday's Committee of the Whole meeting. The Ann Arbor school board once again placed transportation on the chopping block, or at least on the potter’s wheel Wednesday. Board members were left jaded after learning that earlier this week, Willow Run Community Schools and Ypsilanti Public Schools decided to leave Ann Arbor out of a request for proposals that would combine and privatize the busing for those two districts. Currently, Ann Arbor, Ypsilanti and Willow Run are part of a consolidated busing system operated by the Washtenaw Intermediate School District. The consolidated system originally was intended to include at least eight of the county’s 10 districts, said board President Deb Mexicotte. She said Ann Arbor could have backed out when the others did in 2010, but stayed because it knew it was “the linchpin” central to making the system work for the other two districts. “So it does distress me that Willow Run and Ypsilanti did not make a phone call to let us know they were going to go out for this,” she said. Several administrators, including Superintendent Patricia Green, also were surprised by the move. Deputy Superintendent of Operations Robert Allen said if the two districts do merge and privatize, it would cost Ann Arbor Public Schools more money to contract with the WISD. He said right now Ann Arbor, Ypsilanti and Willow Run each pay a percentage of the shared management costs to the WISD for organizing and operating the busing system. If two of the three entities were to leave, the remaining entity would get stuck with all of the management fees. Trustee Simone Lightfoot cited several reports Ann Arbor has requested from the WISD since 2010. “I’d lean toward supporting a relationship with the AATA (Ann Arbor Transportation Authority) before I would the ISD,” she said. Speaking with the WISD to negotiate a better deal for the services it provides and subsequently trying to persuade Ypsilanti and Willow Run not to privatize. Talking to Ypsilanti and Willow Run about becoming part of their request for proposals and effort to consolidate. Breaking ties with the WISD for busing and requesting proposals of its own to privatize transportation in the Ann Arbor district. Breaking ties with the WISD for busing and return to operating its own transportation system again, with cuts to routes and public sector employees. 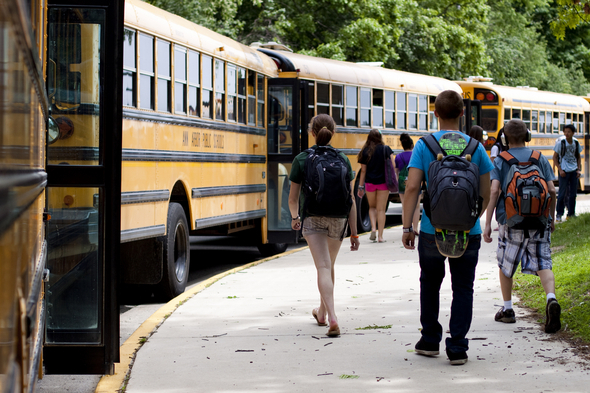 Eliminating busing entirely, or eliminating busing to the district's high schools. The Ann Arbor district made significant cuts to bus service for this school year, a move that brought heavy criticism from parents when it was implemented in the fall. Vice President Christine Stead said transportation “hits her radar” as one area that likely will experience more changes or cuts in the next school year as the district attempts to eliminate its $14 million-plus budget shortfall headed into 2012-2013. She asked administrators to present a list of highly recommended areas to cut as soon as possible. and give families time to think,” she said. Fri, Jan 27, 2012 : 6:51 a.m. If you privatize transportation for our children,you will be taking away the trust we have built up for the people that get our children to and from school safely.Over the years they have become not just drivers and aids ,but friends and in our case family. I know when I put my daughter on the bus ,she will be just as safe as she would be with me.You are now going to ask me to trust the most important thing in my life to someone new because you only want to pay $8.00 an hour .I dont see that happening any time soon. Fri, Jan 27, 2012 : 4:04 p.m. Wait until you get a load of Trinity. Talk about fun. I've been hit twice by them and I was parked. Yup, parked. Go figure. Fri, Jan 27, 2012 : 1:48 a.m.
Are the kids going to park thier cars on the athletic fields? 'cause the lots will be full? How about if they are sophmores? Can they get a permit? ...or did our $250k/year gal think of that? Fri, Jan 27, 2012 : 12:28 a.m.
Nice that the drivers at Ypsilanti and Willow Run have to find out they are losing their jobs through a news article, especially when they just went through this 2 years ago, getting a pink slip and re-applying for their jobs, rediculous! Fri, Jan 27, 2012 : 2:37 a.m. Going to happen to Ann Arbor as well. As for Ypsi and WR? They are consolidating and I hear they will keep the drivers they have. We all knew WISD was a bad idea, it took this long to figure it out. Thu, Jan 26, 2012 : 10:28 p.m.
Fri, Jan 27, 2012 : 3:16 a.m. Same old song, different verse. Even it that money had been spent in the prior formula, the district would be facing cuts again this year. But then you never let numbers interfere with hype. Thu, Jan 26, 2012 : 6:58 p.m. Privatization can only increase the professionalism of the drivers and mechanics, much like Wallmart has done for it's cutomers. One of the most important things a parent must do, is to make sure your child makes it to and from school safely. We as a State; must focus more heavily on flags and pelages, to ensure our children know what they are dying for. The phrase "In God we trust" should be brazened on every school bus before it is issued into service. All school children must be required to carry a rabbit's foot or similar safety devise prior to departure. I'm confident these new changes will ease the stress parents feel, thus creating a more efficient and productive work force for Michigan. Fri, Jan 27, 2012 : 2:35 a.m. Remember this. School bus driving was only created for Special Ed. Somewhere down the mix the rest got tossed in. Michigan could just eliminate busing altogether and the parents are on their own. Yes, this busing thing is a hum dinger ain't it? Thu, Jan 26, 2012 : 9:43 p.m. So the bus drivers earn $10 per hour instead of $18 when they go private. Hows that make things safer, more professional? The Privatization myth keeps spreading. Thu, Jan 26, 2012 : 6:53 p.m.
To all the administration bashers, there is a $14 M shortfall next year. If all the administrators quit, we might save $3M or $4M. This has nothing to do with big salaries, it has all to do with mindless tax cutting for the last 30 years and the crash of the national economy and housing market. Whining about high paid administrators is not the answer. At some point, bus service will be cut or there will be large teacher cuts, or both. We need more money from the state to educate our kids. That $1.8 B cut to businesses that the new business tax has, is a place to start. That is $1.8 B per year less that the state takes in. Now, the intelligencia in Lansing want to cut the income tax. How many more public safety people will be laid of with this cut? Fri, Jan 27, 2012 : 3:14 a.m.
leaguebus - You are only looking at general administration, building administration (where they hide a lot of what other districts call general administration) is another $12-14 million. Thu, Jan 26, 2012 : 11:21 p.m.
&quot;we might save $3M or $4M&quot; Gotta start somewhere---no amount too small. Thu, Jan 26, 2012 : 4:22 p.m.
And if they cut all bussing services, or contract only out to AATA, what happens to the families that live where there is no AATA service or who have parents who have to be at work before school starts? Are they going to write excuses for the parents who can't make it to work for their start time? Fri, Jan 27, 2012 : 2:33 a.m.
You start doing what we do. Get up at 4 in the morning and drop em off at the nearest AATA stop. Good luck. It is happening and I am now hearing Lincoln may join in once WR and Ypsi do their consolidating. Thu, Jan 26, 2012 : 3:59 p.m. It surely would have been great if AAPS thoroughly explored the benefits of consolidation before doing so as it now seems as though it is not working very well. Maybe, if more thought had gone into how to reorganize the AAPS busing, i.e. how can AAPS make the busing more efficient and effective, instead of privatization/or consolidating, the district would not after a short period of time going through the same process -- seems like a lot of waste to me. Thu, Jan 26, 2012 : 3:28 p.m. This is funny stuff, as far as our Great Gov Snyder goes. Didn't he just say there would be more money for education next year? Part of an education is getting to school. On the other hand I took the city bus to school back in the late early eighty's, but parents beware that you are going to spend the money one way or another. Thu, Jan 26, 2012 : 2:43 p.m.
Oh, just end the service altogether. Same the money now instead of chipping away. Have the students get use to walking regardless of the distance. Isn't it coming down to this anyway? Why wait? Maybe AAPS can contract with AATA and combine school and city bus service. Seemingly, AATA needs revenue for a county wide plan, what better way than to have state appropriated school dollars contribute? I smell a win-win! Thu, Jan 26, 2012 : 2:13 p.m. Jaded? You really have my cockles now. Jaded? The board feels jaded? OMG! You folks voted for WISD on June 26 in the evening and didn't have the guts to tell anyone including the bus lot that you voted us out and we had no say. Now you are calling WR and Ypsi jaded? You folks knew this is what they were planning. You folks knew last year there was writing on the wall when they could not get drivers so they let in Trinity at $180,000 a year to help out. Now you are letting Trinity in to do the driving for the high school because you cut half the runs and are realizing after last summer you can't get drivers because no one wants to drive for WISD because they have no clue how to run this operation. The board needs to vote out WISD and enter there in Trinity or re establish what they voted out and start making a profit. I hate to say it custodians. You are next. I am so glad I never came back. Wow. AAPS what a mess you are in. Parents? Start preparing for the worse. I knew this day would come. Good luck. We take AATA because there is no bus to get us to and from school. Thu, Jan 26, 2012 : 1:41 p.m. Yes, BOE - Let's threaten cuts to student facing services before a millage election! Let's not talk about cuts to administration or other non-student facing services! If you put enough pressure on the families with students, they will vote to raise taxes (or so you hope). As to Ypsi and Willow Run, I am not surprised, AAPS has a reputation for being difficult to work with, in the county. Where should cuts be? - Administration, administration, administration -Consolidation of non-student facing services (HR, purchasing, grounds keeping, etc) with the rest of the districts or the city. -Energy bills (use the sinking fund and any remaining bond funds on energy efficiency instead of new sports palaces) -Overall number of sports the district supports -Consolidation of the two smallest high schools - one building will hold them both - don't cut teachers, but again cut the overhead -Pre-school - it was supposed to be self supporting or make a small amount of profit - it is not - get out of the business - turn it over to head start and let them run it. Baseline the budget for the next 3 years with a zero percent increase in funding - right size the non-classroom costs to deal with that baseline. No more 5 percent per annum increase in revenue as a baseline assumption for the budget and then the painful folly of cutting the budget. Only 1 time (this year) has AAPS actually had less money than the year before, but annual budget cuts happen over and over again. ENOUGH - do your job BEO! Thu, Jan 26, 2012 : 3:36 p.m.
Thu, Jan 26, 2012 : 1:38 p.m. I would favor AAPS negotiating with AATA to extend bus service along the Jackson Road corridor. Currently, one bus services high school student living in Arbor Pointe and Country French Estates. The bus is full. So if AAPS cuts high school service, AATA should know that there would be ridership revenue by extending service along Jackson Road--out to Baker is a thought to capture students living in Scio Farm Estates. WAVE schedules are to intermittent to work with AATA in a way to support student schedules. I have mentioned before that there currently is no afternoon transportation options for students living in Scio Township that attend Community High School. By extending AATA service down Jackson Road would make AAPS' alternative high school more palitable for familys. In our family, we do not have children old enough to drive and will not be able to afford a car for school use once they are drivers. I totally agree that those that are unable to provide personal transporation could leave the district to attend other districts or charters that provide transportation. I never did understand the rationale that WISD take over transportation services for three districts and those districts maintain their own local transportation staff as well. I have experienced, personally, the tremendous lack of customer service at WISD. I hope that Ypsilanti and Willow Run are able to contract with a vendor that can provide much better service and that AAPS has an opportunity to work those districts. WISD is challenged to run a cost-effective program with student and family service. Lets do what is in the best interest of our kids (students) to get them to school and leverage community resources to support them in AAPS, Ypsilanti and Willow Run. Thu, Jan 26, 2012 : 2:17 p.m. If they do consolidate? It will be back to business as usual and the way they use to operate. The reason they could not get drivers after the take over was because everyone knew WISD cannot handle this. We all did. If they get rid of WISD they will get their old drivers back. If not? Then they will let Trinity do what Trinity has been doing for over a year now, take over their system. Completely. AAPS? You goofed again. Thu, Jan 26, 2012 : 1:36 p.m. I suppose the highly paid superintendent and administrators with their new big raises came up with these brilliant cost cutting measures. This is why we need to keep paying them more and more. Thu, Jan 26, 2012 : 12:35 p.m. This is easy. Tell WISD to cut their management fees. Since they are covering a much smaller area and running fewer routes, they need fewer managers. Cut the remaining transportation staff at AAPS. Consolidate buildings so there are fewer needs for shuttles during the day. Terminate the failed administrators exiled to the special assignment room. Thu, Jan 26, 2012 : 2:20 p.m. Need to start cutting the salaries in Balais. This is where the bulk of their money goes. Remember the article a few weeks back? High Salaries? Trust you me, cut from the top down. Thu, Jan 26, 2012 : 12:34 p.m.
At the January High School PTSO meeting that I attended, the principal stated that &quot;everything is on the table&quot; when it comes to cuts. So, if we don't cut bus transportation, what do we cut? Humanities? Music? Art? All Freshman sports (including football)? All classes that are under-enrolled? Outsource/privatize Balas payroll, human resources, clerical? To get the $14M in cuts, it looks like the answer is &quot;all of the above&quot;. Until things are fixed in Lansing, like that's ever going to happen, there will be more cuts and they will hurt everyone, especially the students. So, can we just cut bus transportion, even eliminate it for high school students, and commit to alternatives that support the kids? For example, established and reliable community car pools and Increased AATA routes with reduced cost bus passes. Thu, Jan 26, 2012 : 2:21 p.m.
Custodial contract us up in June. Trust you me, they are going to privatize them and no one will be able to stop it. Balais is protecting its own. Thu, Jan 26, 2012 : 12:23 p.m.
AAPS could eliminate the route where the bus flipped over and avoid law suits by not having service on icy roads. But that's a bad idea. Students who have a long, cold walk may: stay home feigning illness, stop at a friend's house and forget to leave, get an unsafe ride in an overcrowded car driven by an inexperienced driver, or, perhaps parents will decide on a private or charter school. Eliminating bus service to high schools will result in lower attendance from the furthest, lowest income students because of transportation issues. Thu, Jan 26, 2012 : 2:22 p.m.
Won't work. The high school will just give them detention for skipping school. All of them do it. Lets not give any one an excuse to feign anything. That accident was the result of poor management. Pure and simple. Thu, Jan 26, 2012 : 12:17 p.m.
What stinks about this? Student at the high school level don't all have a car, or can drive because of age. This will add stress to parents, how do they either get a car for their child or get them to school. Also all the bussing staff will lose there jobs again, this time from the WISD. There was no promise of a job when these school went with WISD. I understand the need to save money, got it! Maybe the districts could consolidate administrative staff, these people make severl thousand dallors more than bussing staff. Thu, Jan 26, 2012 : 12:05 p.m. I wouldn't recommend cutting back any further on transportation for families. The 1.5 mile walk zone is a bit much already, and there are some kids who will have trouble coming to school without reliable transportation help. Thu, Jan 26, 2012 : 2:24 p.m. It again, could down to it where we pay for busing services like they do in Massachusetts. Otherwise, bundle up and start walking. We use AATA because nothing comes our way and we are not walking 3 miles or more to school.